The most correct answer to the now-famous question Frank Costanza shouted at George Steinbrenner during that classic episode of Seinfeld was “on-base-percentage.” That’s why the Boss traded today’s Pinstripe Birthday Celebrant to the Mariners for Ken Phelps in July of the 1988 season. Phelps had put together OBP’s of .400 plus during his last four seasons in Seattle at about the same time Bill James was emerging as baseball’s new statistician guru and preaching that players who could get on base were more important to a team’s success than players who could drive in runs. 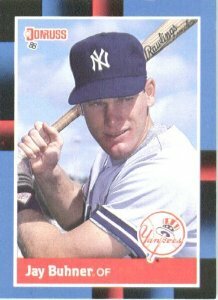 Unfortunately for the Yankees, Jay Buhner became very good at doing both. Buhner had originally been drafted by the Pirates in 1984. The Yankees acquired the Louisville, Kentucky native along with Dale Berra in a December 1984 trade with Pittsburgh in exchange for Steve Kemp and Tim Foli. He caught the attention of lots of Yankee fans when he hit 31 home runs in 1987 for New York’s Triple A team in Columbus. He would get two call-ups to the Bronx, including one in May of the 1988 season, when Billy Martin gave him his only real shot at making an impression in pinstripes. He wasn’t successful, averaging just .228 and striking out almost every other at-bat. Unfortunately for Yankee fans, the team’s impatience with their young outfielder was not rewarded because Phelps turned out to be a failure as a Yankee while Buhner quickly evolved into an offensive force as a Mariner. He went on to become a legend in Seattle, reaching his peak by 1995 when he began a stretch of three-straight 40-homer, 100 RBI seasons. The man who came to be known as “Bone” played until 2001, retiring with 310 career home runs and a lifetime OBP of .359. Buhner made headlines in 2012 when he told an interviewer that he would “vomit” if Seattle re-signed his successor as Mariners’ starting right fielder, Ichiro Suzuki to another contract. Buhner shares his birthday with this former Yankee starting pitcher, this former shortstop and this current Yankee reliever. It wasn’t too long ago that pitcher Boone Logan’s claim to fame was as a traveling companion to former Yankee pitcher, Javier Vazquez. 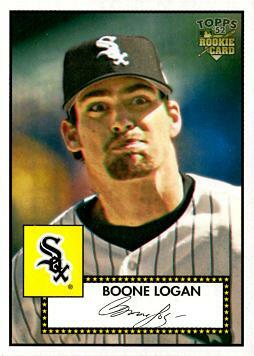 When Vazquez was dealt by the White Sox to the Braves after the 2008 season, Logan went to Atlanta with him. Than when Brian Cashman decided to give Javier a second chance in pinstripes in 2010, it was again the left-handed reliever who accompanied the starting pitcher back to the Bronx. Vazquez’s second tour of duty as a Yankee was no more productive than his first but Logan seems to have found a home in New York. He’s appeared in more than 50 games for the Yanks in each of his three seasons. At first, Joe Girardi used him pretty much as a left hand relief specialist but Logan’s role has gradually expanded into more of a traditional late-inning set-up guy and Girardi now trusts him to also get out right-handers in plenty of situations. He’s put together an 11-3 record thus far wearing the pinstripes and a decent ERA of 3.28. Logan’s sidearm slider is particularly effective against lefty hitters and he also has a fastball that he can throw in the mid nineties. I thought he did a good job in last year’s ALDS versus Detroit and when David Robertson went on the DL right after Mariano Rivera tore his ACL this season, Logan did a great job in an expanded role out of the bullpen. He turns 28-years-old today and shares his birthday with this former Yankee shortstop, this former Yankee starting pitcher and this former Yankee outfielder prospect. Bucky Dent’s historic home run against the Red Sox that just cleared the Green Monster in Fenway to give the Yankees the lead in the 1978 AL East Divison playoff was not the only dramatic blast hit by a Yankee shortstop in Beantown that season. Slightly over three months earlier, the two teams had met under much different circumstances. It was late June, and instead of being tied for first place, Boston then had a commanding seven game lead over the third place Bombers as the two teams squared off for a Tuesday evening game at Fenway. Billy Martin had not yet lost his job to Bob Lemon and the paranoid Yankee Manager was struggling to keep his drinking, his hatred of Reggie Jackson and his fear of being fired by George Steinbrenner all in check. The Yankees had already been pummeled by Boston the night before, losing the series opener 10-4. Dent had been injured in that game so Martin was starting Fred “The Chicken” Stanley at short in this second of what was a three-game series. Boston had Mike Torrez, the same right-hander Bucky Dent would victimize about 14 weeks later, on the mound. Martin started Don Gullett. It was just the sixth start of the southpaw’s 1978 season. He had spent the first two months of that year on the DL. Just two weeks later, as Gullett was warming up for another start, he would feel something catch in his left shoulder. Afterwards, when trying to shave in the clubhouse, he would not have enough strength in that pitching arm to lift a razor to his face and would never again throw a baseball in a Major League game. On that evening in Boston, Gullett did not have his best stuff at the start of the game. In the second inning, the second half of the Red Sox lineup had rallied to score four runs off of him, with three of them coming on a home run by Boston’s ninth-place hitter, Butch Hobson. It looked like another crushing blowout in the making for Martin’s team. But in the top of the fourth, the Yankee bats came to life and five of the first six hitters reached base safely against Torrez and produced three runs. With Yankees on second and third, Boston Manager, Don Zimmer ordered Torrez to intentionally walk Jim Spencer. That brought up Stanley with the bases loaded and his team trailing by a single digit. He pulled the third pitch of his at bat over the Monster in fair territory for a grand slam. Though they called him “the Chicken,” teammates said he had his chest puffed out like a rooster when he walked back to the dugout after that bases loaded dinger. Now with a three-run lead, Gullett settled down and pretty much dominated the Boston lineup the rest of the way. Later in the game, Reggie Jackson would add a three-run blast and the Yankees revenged their 10-4 defeat of the night before with a 10-4 victory of their own. Yankee fans should always remember that even though Dent’s Fenway home run over the Monster off Torrez got a lot more attention, it never would have happened if Stanley had not hit his over that same wall off of that same pitcher, first. Today’s Pinstripe Birthday celebrant was born in Farnhamville, IA on August 13, 1947. He had to be a superb defensive infielder because he lasted for eight seasons in Pinstripes even though he hit just .223 during his Yankee career. Besides that home run in Fenway, the one other exception to his offensive ineptitude came at another opportune time for New York. 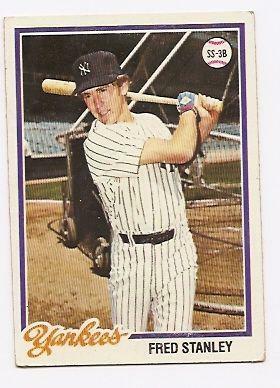 Stanley hit .333 for the Yankees during their 1976 ALC series against Kansas City. He now works in the San Franciso Giant front office. Stanley shares his August 13th birthday with this former Yankee starting pitcher, this current Yankee reliever and this former Yankee outfield prospect. Bill Stafford was a big right-hander from Athens, NY who had once pitched a seventeen-inning game in high school and struck out 31 batters. Just about every team in baseball scouted him as a schoolboy and the Yankees outbid them all to sign him. When he was called up to the Yankees in August of 1960, the Yankee pitching staff was in a slump, especially the starting rotation. The highly poised youngster proceeded to win 3 of his first 4 big league starts and provided the mound-boost the team needed to surge past a surprising Baltimore Orioles team and win the AL Pennant. Too bad Casey changed his mind about starting Stafford in the seventh game of that year’s World Series against the Pirates. The kid went to bed the night before thinking he would be starting the next day but when he got to Forbes Field he found out the Ol’ Perfessor had decided to go with Bob Turley instead. Bullet Bob gave up three quick runs and the Yankees were never in the lead.The following season, new Yankee manager Ralph Houk put Stafford in his starting rotation and over the next two seasons, he went 28-18 in that role to help New York win two consecutive World Championships. He got his only postseason win in Game 3 of the 1962 Fall Classic, when he held the Giants scoreless for eight and two thirds innings in a brilliant, four-hit, 3-2 victory. At that point in his career, he was just 22-years-old and the sky seemed the limit for this guy. I clearly remember thinking he was on his way to becoming a Hall-of-Fame pitcher and if the Yankees had put him on the market after their ’62 Series triumph, they could have demanded and received just about any player in the game in return. That’s how good Bill Stafford was. So what happened to him? 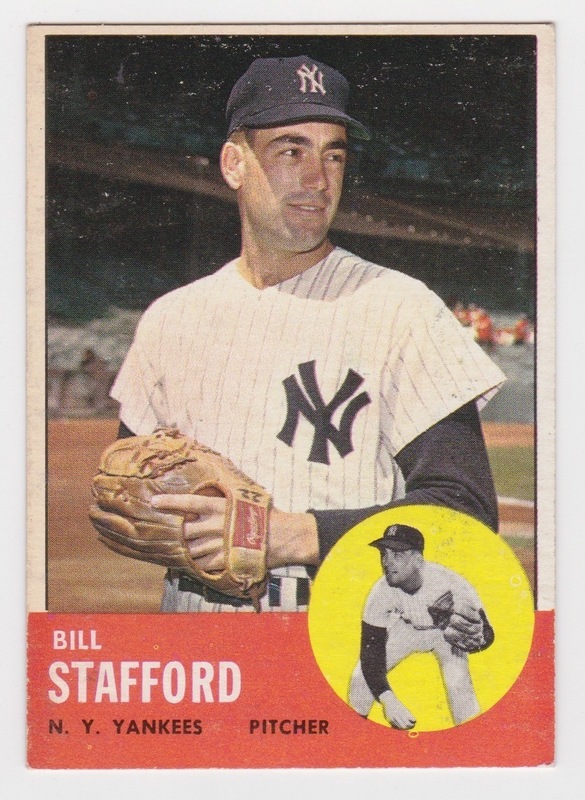 On April 10, 1963, Stafford made his first start of the season against the A’s in Kansas City. There were fewer than 4,000 people in the stands and the temperature at game time was way below normal for that time of year in KC. Stafford grinded his way through six plus innings and got the win but he also hurt his arm. Instead of resting, he tried to pitch through the injury but finished the ’63 season with a 4-8 record and was demoted to the bullpen. His right arm was never the same after that season. New York put him in the bullpen in 1964 and he went 5-0 in 31 games as a reliever. He was then returned to the rotation in ’65 and finished that season 3-8, as the Yankee dynasty began to crumble away. Stafford was traded to the A’s in June of 1966. He was out of baseball by 1968. He died of a heart attack in 2001 at the age of 62. He shares his birthday with this this former Yankee shortstop, this current Yankee reliever and this former Yankee outfield prospect.